ChannelReply makes Gorgias-, Desk-, Freshdesk- or Zendesk-Amazon integration a cinch. Start by connecting your helpdesk by following the instructions for Gorgias, Desk, Freshdesk or Zendesk. Then follow along with the written instructions or video below, and you’ll have your Amazon messages in your favorite helpdesk in no time! Use Help Scout? Follow these instructions instead. Note: Click on any screenshot to see the full-sized image. Text last updated 3/26/2019; some statements in the video are outdated, but its instructions still work for setting up your account. Sign in to your ChannelReply account by clicking “Sign In” in the upper-right corner of the screen. If you don’t have an account yet, just click "Start Free 14-Day Trial" to get started. You should arrive at the screen shown below after signing in. You can also reach it by clicking “Manage.” Once you’re there, click “Marketplaces” to begin setting up your Amazon account. You will arrive on the "New Account" screen. 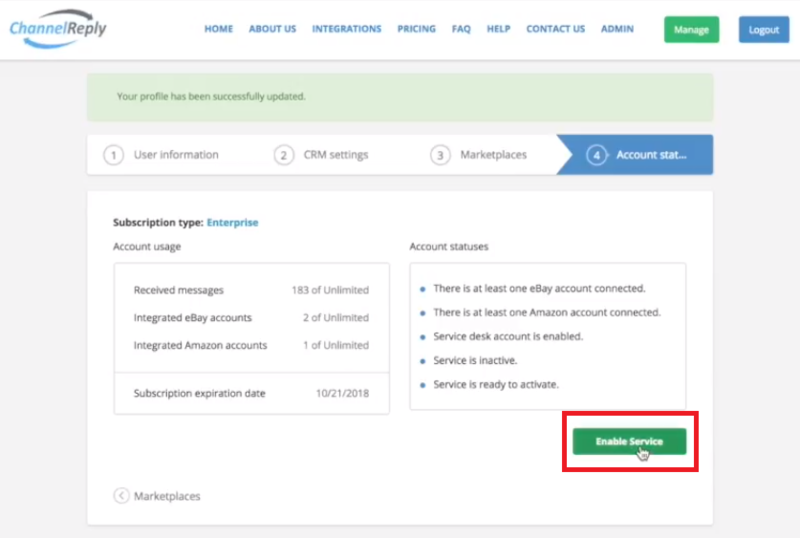 If you have previously connected Amazon accounts with ChannelReply, you will see the "Connected accounts" screen instead, in which case you should click "New Account" to get started. Next, create your new support email. Simply enter a username and @channelreply.email will automatically be added to the end. Checking off the “Default” option will set this account as the one your helpdesk uses when you initiate conversations with Amazon customers. Be sure to check it off if this is your only Amazon account. If you have more than one Amazon account, choose only one of them to set as your default. 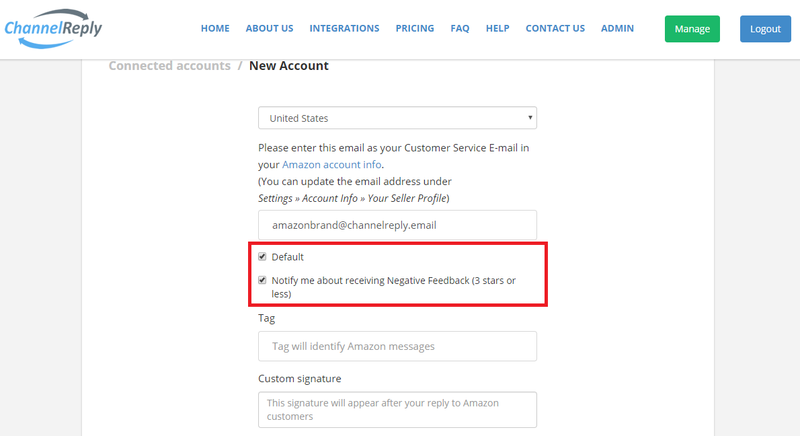 You can also choose to receive negative feedback notifications for this Amazon account. This feature comes at no extra charge, but the notifications do count toward your monthly message limit if you have one. Next, enter a tag for this Amazon account. In your helpdesk, this tag will identify every message you receive from this account. 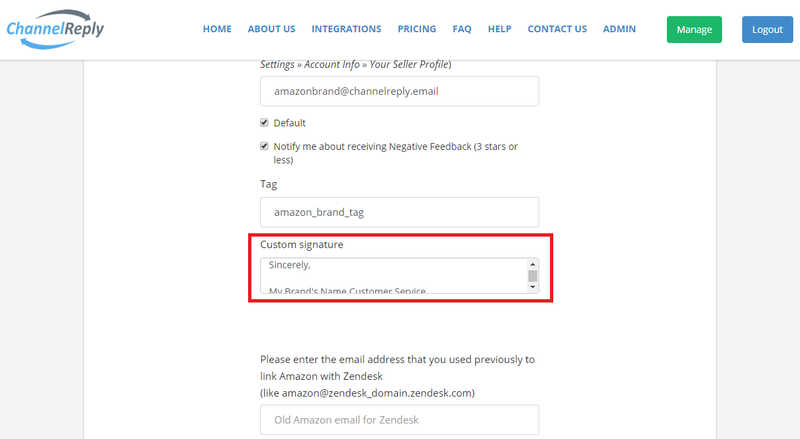 You can also enter a custom signature that will appear at the end of every reply you send. Note that this will appear in addition to the signature in your helpdesk, if you have one. Be careful to avoid including any links that would violate Amazon policy in any signature. That goes for any signature in your helpdesk and any you create in ChannelReply. If you previously linked Amazon to your helpdesk with email forwarding, you should enter the old address in the “Old Amazon email” field now. Doing so will let us deliver existing Amazon tickets. Once finished, click “Save” to finalize this information. This will take you to Amazon Seller Central. All you need to do on the next screen is click “Continue” to return to our website. You’ll be brought back to the “Connected accounts” page. 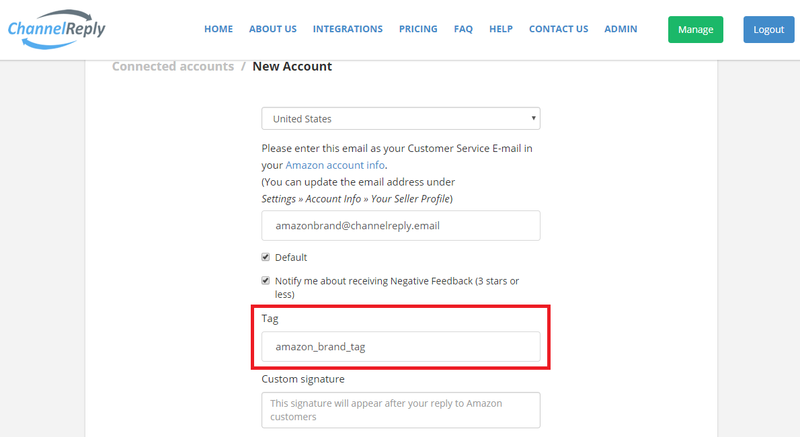 You should now see info about the Amazon account you’ve just integrated with ChannelReply. Let’s just check one more thing to make sure Amazon has applied all the changes. Click "Settings" in the upper right of your Seller Central screen, then "Notification Preferences." Scroll down to “Messaging.” See if your @channelreply.email address is listed as the email for “Buyer Messages.” If it isn’t, simply click the orange-yellow “Edit” button to the right of “Messaging.” Then enter your ChannelReply email in the “Buyer Messages” field. You’ve now integrated messaging with your Amazon customers! If you want, you can also choose to have ChannelReply deliver your one-way Amazon notifications. That way, if a notification is relevant to a specific customer and/or order, you’ll see all that data in the ChannelReply app. 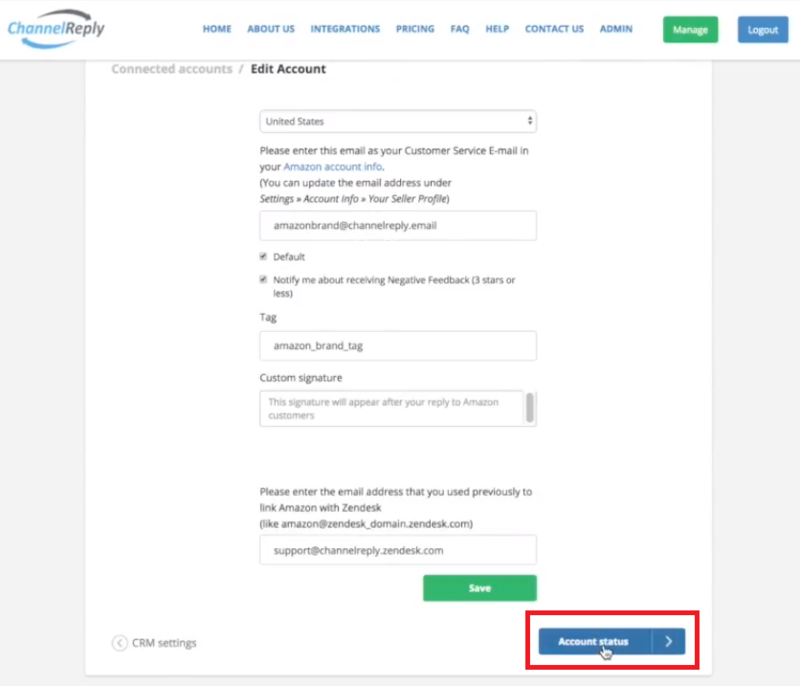 To have ChannelReply manage delivery for any kind of one-way notification, simply click the appropriate “Edit” button and replace the old email with your ChannelReply address. Just note that all messages delivered through your ChannelReply address will count toward your monthly message limit. You can forward messages straight to your helpdesk to avoid this, as described in "How to Forward Amazon Notifications to Your Helpdesk." 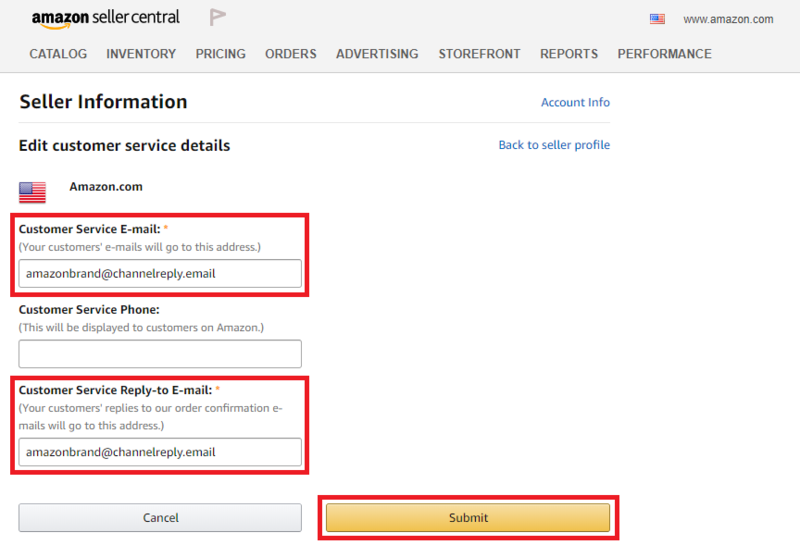 If you ever need to make changes, you can return to this page by logging in to Amazon Seller Central and clicking Settings -> Notification Preferences. Here you can see account stats and enable or disable service. If you see a “Disable Service” button, your account is currently running. If you see “Enable Service,” click the button now. Congratulations! 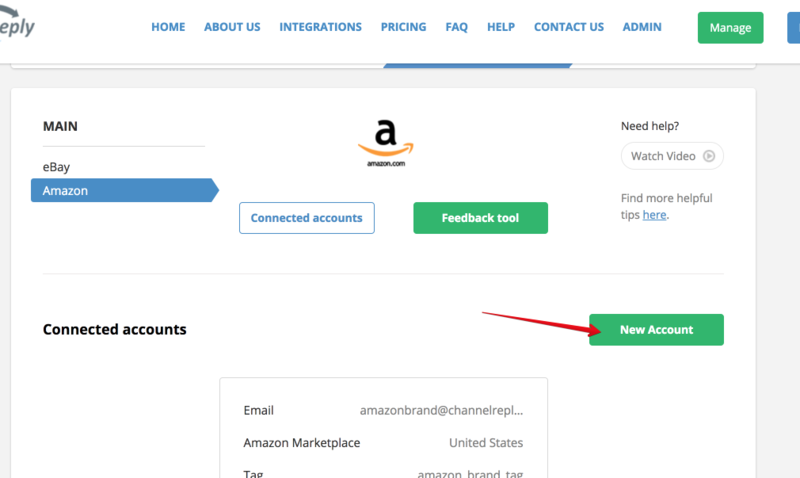 You have now integrated your Amazon account with ChannelReply. 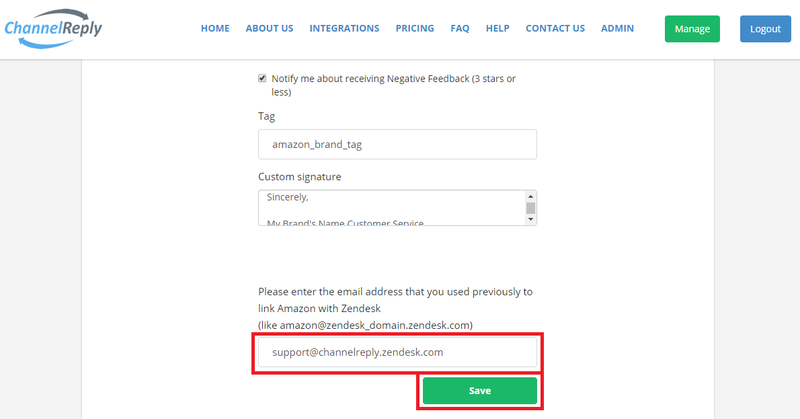 We’ll start sending Amazon messages to your helpdesk (Zendesk, Freshdesk, Gorgias or Desk) presently. Need to see account details or make changes? 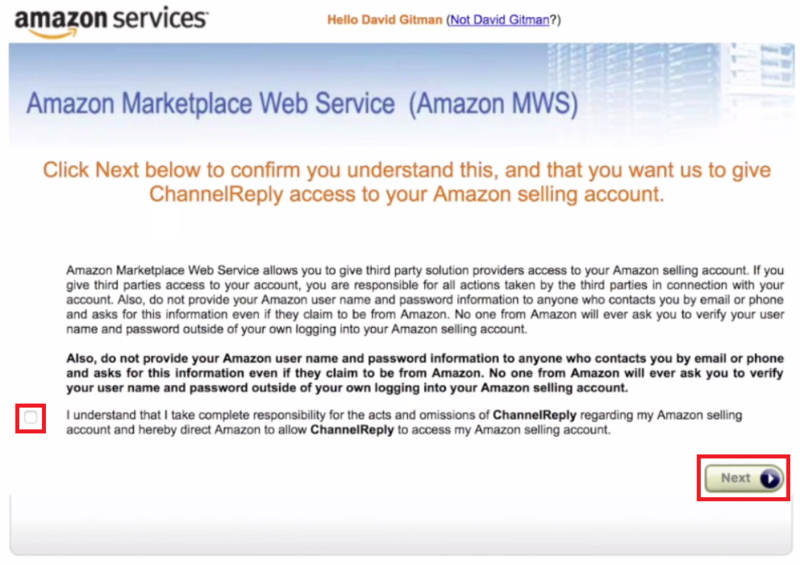 Simply sign in to your ChannelReply account and go to Marketplaces > Amazon. You can review and edit your details under “Connected accounts” anytime. North America: Canada, the US, Mexico, and Brazil. Europe: The UK, France, Germany, Spain, Italy, Turkey, and India. Far East: Australia and Japan. 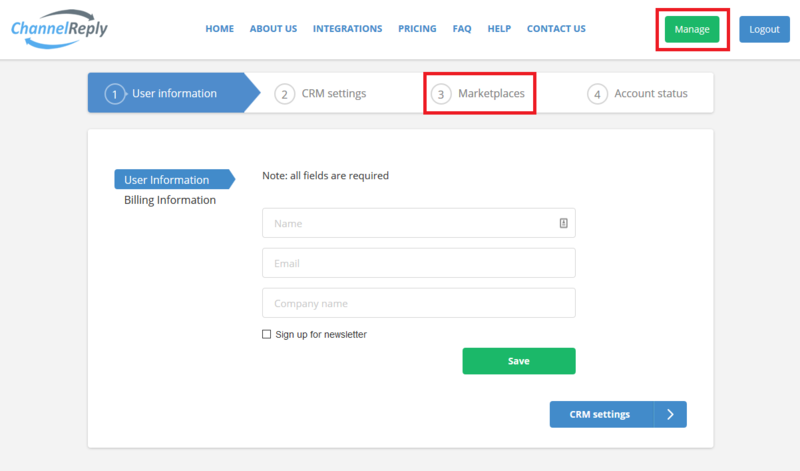 You do not need to complete a separate integration for countries in the same region unless you use a different Seller Central login for them. 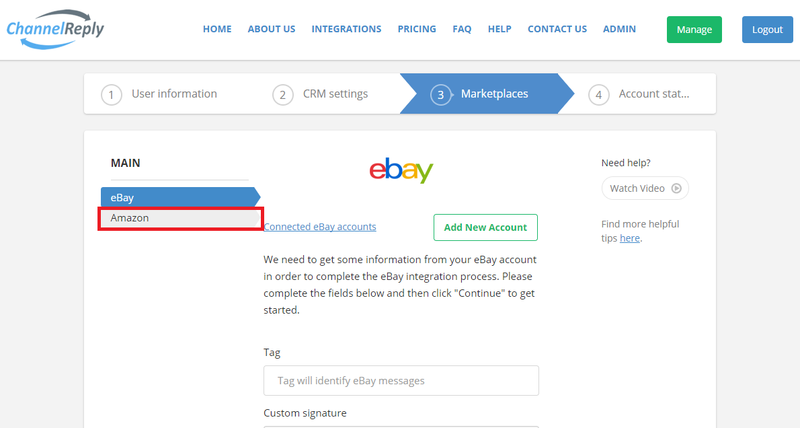 To add a new region or connect an account with a different Seller Central login, click “New Account” and follow these instructions from the beginning. 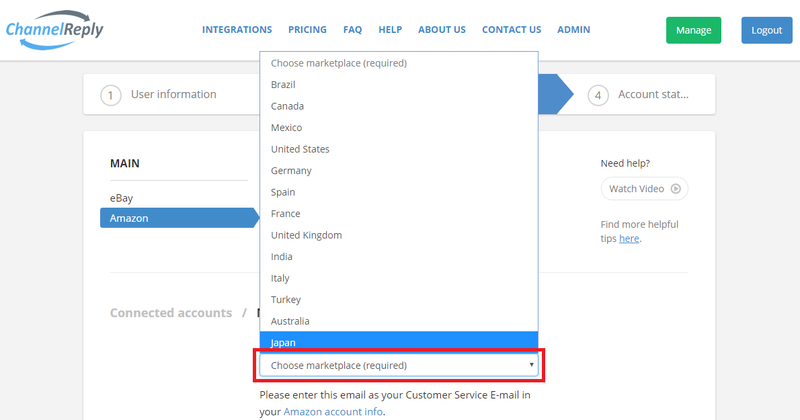 See How to Add Additional Amazon Accounts and Countries for more info on integrating multiple Amazon marketplaces and accounts. When Will I See My Messages and Customer/Order Info? All new Amazon messages will be delivered to your helpdesk immediately, and you should see the ChannelReply app on all messages. However, you may not see customer and order info displayed on the first few messages you receive. This happens because ChannelReply collects this data from the first message in each conversation with an Amazon customer. If the first message in a conversation is not processed by ChannelReply, the info cannot be displayed. So, it's common to see no order info at first, but after a couple weeks it will be displayed on most or all messages. We hope you enjoy your simplified customer service experience! If you run into trouble or need any assistance with Amazon integration, please don’t hesitate to contact us. We’re always happy to hear from you!